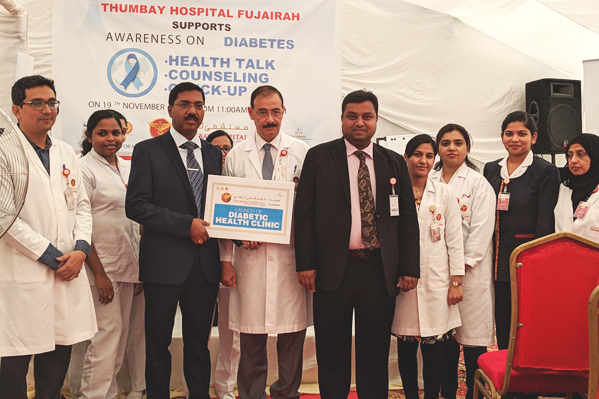 Thumbay Hospital – Fujairah, the leading academic hospitals under Thumbay Group’s Healthcare Division conducted a diabetes awareness event on 19th November 2018, to mark World Diabetes Day. The awareness programs included a health talk by Dr. C. R. Sathyanarayanan – Specialist – Internal Medicine & Head of the Department, Thumbay Hospital Fujairah. 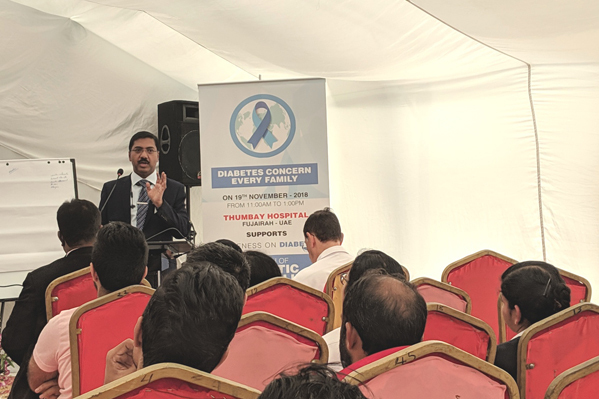 Further, free diabetes screening was offered to attendees and visitors, in addition to free consultations with the physician, physiotherapist, dietician and nursing educators. Also part of the event was the launch of a Diabetic Health Clinic at the hospital, aimed at offering multidisciplinary care for the patients, including counseling by Ophthalmologists, Surgeons, Physiotherapist & Dietician. The clinic will operate within the hospital once a week (mostly on Tuesdays, from 9am to 11am). The hospital also plans to offer various cost effective diabetes treatment packages patients.